GPU i dont have nothing better that ATI 2 MB mach card for testing, i have 2 times Geforce 7950GT 512 MB but there huge and its means messing with Unofficial drivers and Rloew Nvidia patch (its hard to say that is working, i can play games, but i have lots of other issues with 1 machine, when im trying to use it, maybe patch could be ok, problem could be elsewhere ) .. and other huge used Geforce 6600 GT - big passive + Noctua fan. But i can say that in my Unraid sever 512 MB version of Geforce 7950GT running well, without any patches, so it could run within Windows 98 somehow. I had Geforce 7300 for such testing, but it died, i will not risk Voodoo 3 transport..
That's why I say to keep it simple remove all PCI and PCIe cards. Just use the Intel HD graphics HDMI port for video. I checked for your CPU but you didn't show all 4 digits. But even all Haswell in i5-44XX line up will have at least basic Intel HD Graphics 1000 low end. Go to the BIOS and you can change the graphics shared memory down to 32MB for the first install test. You can use Bear Video driver if you want but not necessary for doing Audio card sound output test. Then add your SB Audigy 1 PCI into the PCI Slot see if it detects or you have to Detect New Hardware to scan for it. My feeling is it will not see the audio card and you can't install the drivers or get any audio output. If it can't see this most compatible sound card for 98SE then it's a dead end for sure as far as gaming natively. Of course that im mad.. now upgraded by 3 screws in the back.. I just tested some better that cheap USB souncards around 8-12$ tier, i just player few games and it was good enough for me.. Simple Syba 2 jacks USB card is probably best, others have more ports, even buttons but sound quality is not so good. I even saw so me test of those cards on YT and this one was best.. I have here now 5 different models, even 2$ piece is ok, with Windows 98 games has problem only in never OS were are more demanding games from audio perspective => very noisy sound. You tested this on Z97? Did you try the SB Audigy 1 PCI card on it? I thought you said the USB ports were not working? No on Z97 a i have Windows 98 machine, but on AMD970 cheap AMD 8 core machine its runnning fine as all USB audio 1 compatible devices, its just plug and play.. Okay we need to find out if your Z97 can't work with the SB Aud 1 PCI. AMD 970 already known to work with 98SE. Update to Gigabyte z97p-d3 Audigy SB0160/0162 Sound card its working. I used this driver, simply driver installed and VDM driver, there is also VXD possibility i dont know that is better..
All what is tested with sound is working, system sounds, Dxdiag sound test etc.. I will test some games later. PS2 mouse working too of course. Use CPU is here Core i5 - 4460, 4 core no HT, primary origin for this slimer are Unraid experiments. So main issue is now not working USB, it could be bypassed by USB2 controller, but will out of 1 of 2 PCI slots, so will need to buy lots of PCI-E to PCI adapters - they working with AM3 board so i will probably with this board to, same as PCI-E GPU with proper Win98 driver, im testing too PCI-E card with Russian Bear universal driver - no 3D and there is other issues..
What PCI card low-profile wireless can I buy for Win98/XP? LINKSYS WMP600N? 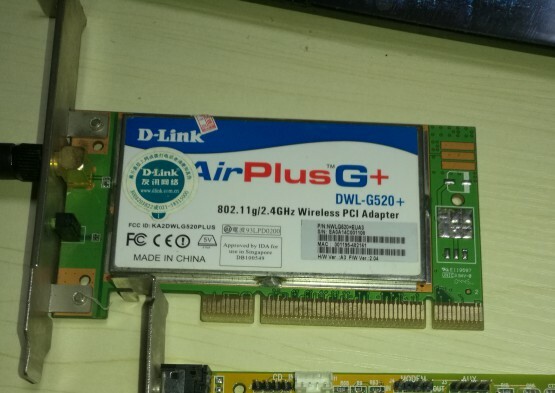 D-link AirPlus G+ (DWL-G520+) is a PCI 802.11g Wifi adapter that works ALMOST flawlessly on Windows 98. The best part is that it supports WPA2 on itself without any additional access clients or upgrades! And it's easily available, dirt cheap. I got mine for 10 CNY shipped. That's less than 2 USD! It doesn't want to really work in 54Mbps mode; the max speed I could get from it was sub-10M. Enough for light daily web browsing, but not an iota of good for file transfer. It only has the wireless utility. You'll have to find the actual device driver elsewhere. The wireless utility doesn't work on system launch. You will need to manually exit and restart the utility once for the system to have a correct Internet connection. 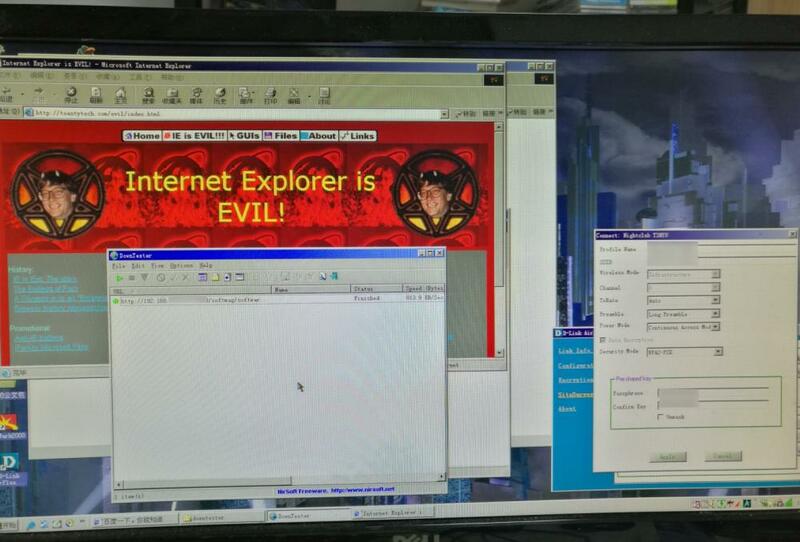 Other than that, I say it's a pretty decent choice if you want to connect your Windows 98 machine to da Internet. For slow speeds, use TCPOptimizer 3, and apply the VIP.386 (and others in Device Manager where is the network card) patches, if they are available in your language. What is the hardware ID of the WIFI card? I mean the VEN and DEV. I have an Atheros AR5005G in my IBM ThinkPad T40, and I use Odyssey for full WPA2 support on 98SE. 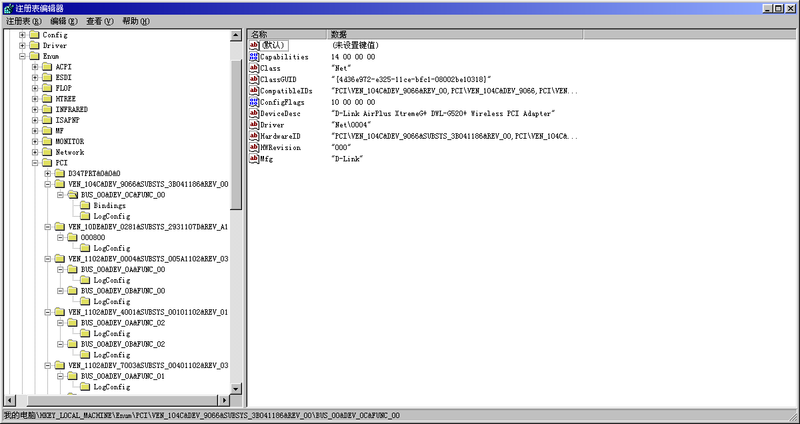 I've looked at the drivers for your card, and found Atheros's hardware ID's. According to my registry, it says PCI\VEN_104C&DEV_9066. TIACX.DeviceDesc_Cardbus = "D-Link AirPlus XtremeG+ DWL-G650+ Wireless Cardbus Adapter"
TIACX.DeviceDesc_PCI = "D-Link AirPlus XtremeG+ DWL-G520+ Wireless PCI Adapter"
Maybe we're looking at different drivers? PS: Thanks for the tip! Unfortunately, TCPOptimizer didn't work for me; also I failed miserably at Googling VIP.386 patch - what is it actually? It seems like your card uses Texas Instruments ACX 111 (aka TNETW1130) chipset. I've found the proper drivers now, seems fully compatible with 98SE/ME/2000/XP. No Vista+ drivers I could found. Nice found, definitely will help some people. Is there any new discovery about PCI-E Gigabit adapters? So far i managed to get working only Broadcom 5721M but, it has shutdown problem. I know there were some discoveries with DOS drivers, are they full replacement of native Windows drivers, or they are worse and limited? I made Win98 working on Z170 - GA-Z170-HD3(DDR4 version, im using 1 - 3000 MHz stick), it has 2 PCI slots, thanks MrMateczko for H110 project info . It would need more time and testing, but its at least somehow working. I used Geforce 730 for XP+. And Geforce 6200 Turbocache for Win98. I had problem to make Yamaha 744 working (i tried few drivers from Vogons library, but i sound never worked - exclamation mark on Legacy audio virtual device, when i disable it no sound, or no boot), but Aureal Vortex 1 is working, also disk operations are slow Promise Sata 300 TX4 PCI and Micron PCI-E Sata II are working - but only without DMA - 3 MB/s. Rloew has some patch for on board Sata - 21 bucks for bigger speed. and other 10 for Sata AHCI CD.. So far i tested Diablo II shareware - fine, Warcraft III demo - fine. Quake 3 demo - is not working broken picture, same Unreal Tournament in Opengl, its working with Direct3D and Glide (nglide 1.0.5), but its freezing after minute of games.. These graphics problems, could be because im using unofficial NV 82 drivers, moded for 512 MB Geforce 7 -Rloew patch.. i have to test unmoded drivers. Update: Freeze is the same with 81.68 driver - only it took 5 minutes, i got some freezes with Windows 7 load screen, MB is second hand so it could be some cooling (MB bridge cooler is crappy one) or other MB problem, Geforce 6200 turbocache is passively cooled, it can be overheating too. Regarding of OpenGL - i suspect C:\Windows\System OpenGL32.dll which file should be here some from Microsoft or some of Videocard vendor, i remember that in the pass it something with it.. I think that it is not related to DirectX, could someone share good one? I havent too much time try to monitor temperatures in Windows 7 etc. Just for info i tried to boot old WinXP installation, but there is some ACPI error, i had the same one with Z370 XP and i had to install XP in MPS mutiply processor mode, instead of HAL, but there is person on forum, who is able to BIOS to proper ACPI at least for XP.